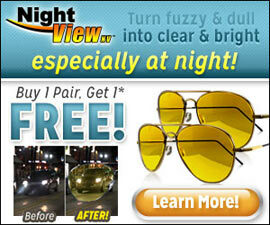 Night View NV Glasses offer a safe and effective way to drive at night. Nighttime glare can be a problem for many drivers, but this revolutionary product works to counter the potentially dangerous effects by enhancing both clarity and color of vision through formulaic coated lenses which stop the glare from occurring. These glasses are completely changing the experience of driving at night for many drivers. Strong and durable–hold up to all kinds of abuse, including from my toddler!